Blog › Information › Join us at the RHS Show in Kidderminster!! Perhaps you'd like to attend the Royal Horticultural Society (RHS) Show this season near you...? Come join us at Kidderminster RHS event on the 13th and 14th September, for a Summer weekend opened by the BBC Hereford and Worcester, Midlands presenter Michael Collie. For just £2.50 entry fee and FREE parking, two days full of beautiful flowers, plants and garden art, designed for outdoor display, will be guaranteed to entertain the whole family. The country fair is being held in the Mercure Hotel grounds all day Saturday and Sunday, for more information, please select the link below. We shall be exhibiting a range full of garden decorations, such as our garden accessories and garden furniture, to add further touches of colour to your garden. Maybe you've meet us before at one of the Malvern exhibitions we regulalry attend. We are always happy to discuss any of our products found here on our Website with you in more detail, and welcome any art suggestions you may have for us, to add to our expanding collections. Don't forget to leave us your email address, to ensure we email you our regulalry special offer discount vouchers. Why not become a member of the Royal Horticultural Society today, and visit gardens with the family throughout the spring and summer months. 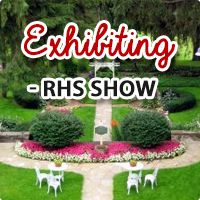 Simply select the link below to find our more about the RHS. Remember to browse throughout our garden decor online before you go....we look forward to seeing you there!! The RHS Home page gives you up-to-date information each month along with access to advice, plants, joining the RHS,gardens, publications and much more.